Do You Know Your Health Status? Find Out Why This Is Important!!! Today I want to talk about knowing your health status! It is so important to understand the factors that contribute to our ability and inability to lose weight. There are varying factors including genetics, environmental factors, habits, diet, exercise and your individual current health status physically, mentally, emotionally, spiritually etc. I believe that is important to take a holistic approach when looking at your health. Today we are going to start with your physical health picture. It is critical that you go to the doctor and have your yearly health examination/physical done. You need to know your status. In fact TODAY I am going to get my physical done. I can’t wait to get my results back! Why? So I will know what action I need to take to either improve or maintain the status that I have. Hopefully I will hear good news that my Blood pressure, A1C, Cholesterol, Iron, Thyroid…etc levels are normal. But you won’t know unless you go! 2 years ago I found out why I was having a problem losing the weight that I had set my goal to lose as a result of having my physical done. I found out that my thyroid levels were not normal, as a result I went to see a Thyroid Specialist. They did their exam and found out that I had tumors on my thyroid that I later found out were benign (THANK GOD) but I still had to take action and get my thyroid removed. After my thyroid was removed I had to begin taking a prescription thyroid hormone. To date I have been on 3 different types to find the right one that will work best for me. Because of my thyroid levels not being normal I hit a metabolism wall that could not be overcome with food or exercise. But I did not give up after 2 years today I am finally at a normal level and so NOW I can go back to my 30 day challenge and see some results. After 3 days on the challenge I have already lost 3 pounds! Listen the plan works but you have to work the plan, you have to be consistent, you have to be vigilant and know your health status. I hope this post encourages you to go get your physical and to stay on top of your physical health. Why? Because YOU ARE WORTH IT! So what now? Eat clean & train mean! Do YOU really BELIEVE that YOU CAN DO IT? Happy Hump Day! 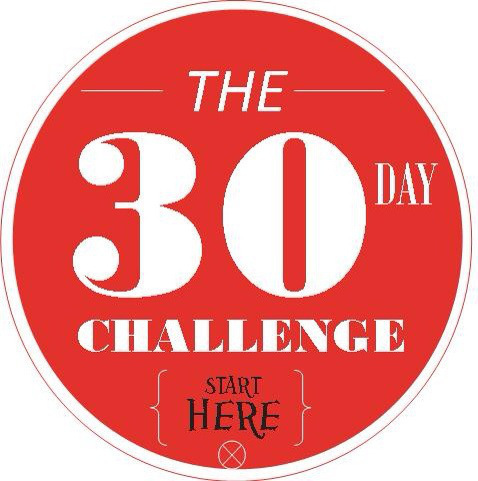 It is day 2 of our 30 Day Challenge & I am so excited about it! I am looking forward to what this month is going to bring as we make healthy choices, become more active & get an adequate amount of sleep! But…. first things first! You HAVE to start this challenge with a belief that it is possible, that YOU WILL be successful on this challenge, that YOU CAN do it! Every venture & every challenge worth starting must begin with FAITH. Faith believes, Faith speaks, Faith works! Speak it, believe & let’s put our faith to work during this challenge by sticking to the food plan, exercise & sleep plan for this month. Today I declare and pray for everyone taking part in this challenge, that you will be successful on this challenge, that you will be able to lay aside every weight that will try to hinder you from making progress this month. When I speaks of weights I am talking about bad habits, unhealthy food choices, inactivity, unbelief, low self-esteem, impulses, proclivities, ANYTHING that would try to get in the way of your progress this month. Do me a favor get a piece of paper and write in the center of it “I CAN DO IT!” Look at the example I have provided in this picture above. Put “My 30 Day Challenge” at the top and what your starting weight is. Beside that write the words “Final Weight” so when the challenge is over you can put your final results in. Feel free to write any other inspirational phrases that motivate you below “I CAN Do It”. Write what your weekly weight loss goal is at the bottom right hand corner of the page and on the left hand corner write “Week 1 actual:” and so on for 4 weeks so you can document the actual weight you lost each week of the challenge. We will weigh in weekly on Tuesday mornings to measure our progress. Once you have completed this tape it on your mirror in the bathroom or somewhere you visit often in your house like the refrigerator (lol) so you are constantly reminded of your goals for this month. The main point of the post today is show the importance of faith in this process and the importance of goal setting and measuring your progress. These in addition to you implementing your plan will help ensure you are successful on this 30 day challenge. I am praying for you and I am believing with you that YOU CAN DO IT! Make sure you let me know if you are taking this challenge with me this month so I can pray for you by name. Send me a message or email me at info@monicaakerele.com put “30 Day Challenge” in the subject line or you can just respond to this post. Click on the follow button so you can get updates to my motivational blog as I publish them daily! Follow me on Twitter @MonicaAkerele for more motivation.